This is a guest post by Jean Laherrère. I read your excellent questions. Do you have any answers posted? I decided to update my past papers on hydrates. Laherrère J.H. 2002 Hydrates: some questions from an independent O&G explorer Introduction as chairman of RFP 9 "Economic use of hydrates: dream or reality?" WPC Rio, Sept 5. But in the case of hydrates, the source, reservoir and seal are the same, comprising the 500 metres of unconsolidated sediment beneath the seabed. Since the hydrate is solid, there is no possibility of migration. Furthermore, hydrates being only about 1% of the porosity, the rest is 99% water, so, the gas hydrate stability zone (GHSZ) does not correspond to a seal. Free gas stays because it is in this state in the zone where hydrates are converted into gas. Leg 164 in the Blake Ridge found that the percentage of methane is about the same above and below the bottom simulating reflector (BSR). The estimates of hydrate volume assume that most of the available organic material is converted into hydrates. The percentage of total organic carbon (TOC) is around 1% when the percentage of hydrates is around 1% of porosity, or 0.5% of the total volume. We have also to take into account the geological time factor. It is hard to believe that hydrates contained in the first 600 metres of oceanic sediments covering a period of less than 10 million years could hold two times more carbon than the fossil fuels from 6,000 metres of sediments covering a period of more than 500 million years. Holbrook (1996) estimated in the Blake Ridge study that 30 Gt of methane hydrate (23 Gt of carbon) occurred in deposits laid down over six million years, namely at the rate of 5 kt/year. This compares with the following estimates from other sources of methane (Neue, 1993). The methane hydrates accumulated in the Blake Ridge at 5 kt/yr, representing about half the present methane coming from all the oceans. It is noteworthy that the amount of biogenic marsh gas (wetlands) or bovine methane (enteric fermentation) is about ten times that in oceanic methane hydrates. For example, Bonham (1982) estimated that there was as much as 50 000 Tcf in geo-pressured brines in the Gulf Coast. This is much larger than the 1300 Tcf attributed to the Blake Ridge hydrates by the USGS, which is obviously a much more reliable resource. The fact is that there is no commercial interest in oceanic hydrates. Chevron, testifying to a US Senate Committee in 1998, correctly stating that hydrates occur in low concentrations and have no commercial potential. Gazprom likewise dismissed submarine hydrates (Krason, 1999), on the strength of substantial Russian research. Oil companies are involved in hydrate projects only in Japan and India, which are countries with limited indigenous oil and gas facing the growing cost of fossil fuels imports. Abstract : The study of natural gas hydrates is of big importance as gas hydrates provide a large potential energy source. About 70 areas with gas hydrate evidences are known in the World Ocean. Gas hydrates have been directly evidenced by visually observation in 20 of the above areas. In the other 50 sites gas hydrates related reflector (BSR) or specific seismic signatures like VAMP’s were recorded. BSR is only an indirect evidence of hydrates and gas immediately above and below the reflector. Attempts to seismically determine gas hydrates in sediments gave no reliable results yet. Extensive theoretical and experimental studies including global and regional assessments of gas volume in gas hydrates have been carried out. The global gas hydrate reservoir has been estimated to an amount as much as 7.6·1018 м3 of gas, but published assessments differ by 3 orders of magnitude. The various projects of gas extraction from gas hydrates have been proposed. At the same time the following problems have still to be cleared up: what do the accumulations of natural gas hydrates represent; what are the deposits dimensions and configuration; what are their 3D parameters; how big volume of gas contain in separate hydrate accumulation. It is up to the nearest future investigations to solve these problems. During the last 10 years VNIIOkeangeologia has carried out investigations on gas hydrates around the world. It was established that: submarine gas hydrate formation represents a global physical and geological event; the amount of gas hydrates in the sea basins is more determined by concentrated gas hydrate occurrences (gas hydrate accumulations) than by uniform distribution of gas hydrates in sediments; the location of gas hydrate accumulations is controlled by special geological conditions; the major role in formation of submarine gas hydrate accumulations belongs to fluid filtration as well as to diffusion processes. Estimation of the total gas quantity concentrated in gas hydrate accumulations of the Ocean based on our results is almost 100 times smaller than previous estimates. However, the estimation is still in the same order of magnitude as the total remaining conventional natural gas. The presentation (35 slides) displays many pictures of hydrates in particular of Lake Baikal. They believe that accumulations related to fluid discharge areas near the sea floor are renewable. 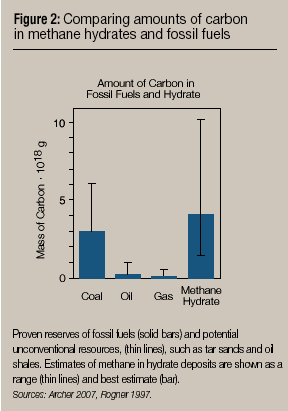 Hydrates of methane (a solid which contains 160 times more methane in volume than Natural Gas) are reported by some as representing more reserves than all other fossil fuels combined. Thid is completely wrong because oceanic hydrates in sediments of less than few millions years (Ma) cannot match fossils fuels issued by sediments during a period of more than 600 Ma. These unrealistic estimates have been divided by 100 (Soloviev V.A. 2004 “On gas hydrate mythology” IGC). Out of thousands of holes drilled by JOIDES only 3 found hydrates thicker than 15 cm and the last thick occurrence (leg 164) has shown no continuity in a hole drilled 20m apart. Oceanic hydrates are heterogeneous and of limited extent : few millimetres vertically and few meters horizontally. No methods are known to produce them. Japan and India have drilled many wells since 1999 to core oceanic hydrates, and despite their needs of gas, there is no plan to produce them. There is no known technology to produce oceanic hydrates. Continental hydrates in permafrost have been found, but they are accumulated in conventional gas fields which were trapped as free gas before the glaciations 2 millions years ago. Now in permafrost they do not add anything to conventional reserves except problems! The knowledge of oceanic hydrates occurrence comes mostly from proxy data and few direct proof or pictures of hydrates in cores exist. The drilling for hydrates by the Japanese in 1999 in Nankin was reported for years as having found hydrates, but a few years later it was recognized that no hydrates was cored, only proxy data (seismic, logs, chlorine concentration). It is difficult to find pictures of cores with large hydrate occurrence. What is published must be the best ones! After the drilling of several wells in Nankai in 1999 failing to recover any hydrate in the cores, Japan went back to the permaforst in Mallik, where hydrates had been found already in 1972, in order to core real hydrates. After the lack of success in production in Mallik, Japan went back again to Nankai and drilled many wells. 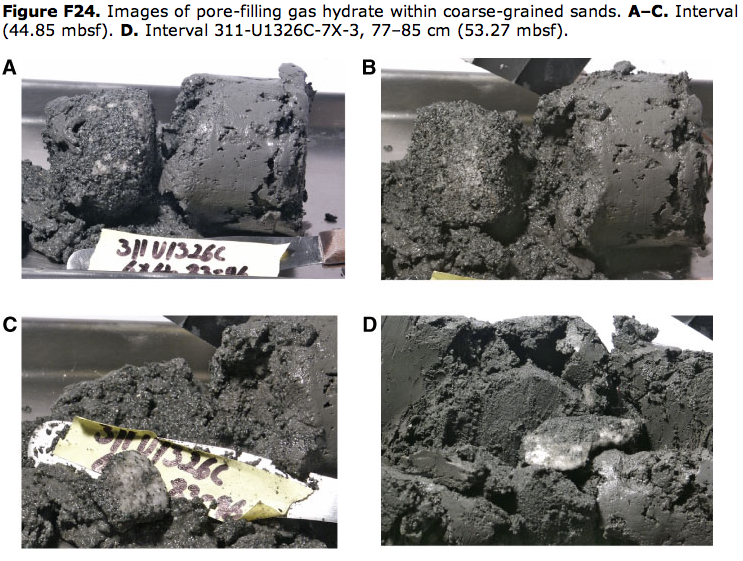 NETL (The gas hydrates resource pyramid) published a core showing sand and disseminated hydrates. 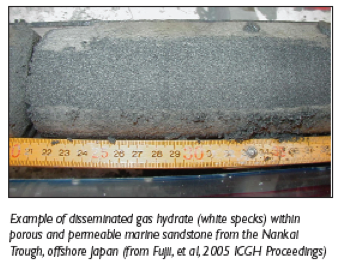 Figure 1 - A core drilled in Nankai, offshore Japan, showing sand and disseminated hydrates. There is a rumour of a production test for 2009. But Japan needs gas and should be the first country to invest in hydrates if there are enough reserves and technology to produce it. 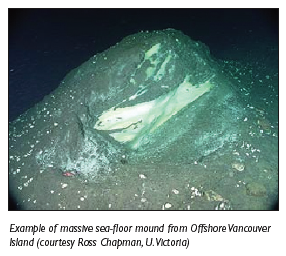 at Sites U1326 and U1327, where gas hydrate was observed in sections several tens of meters thick at a shallow depth of ~100 meters below seafloor (mbsf); concentrations exceed 80% of the pore volume. Another site of very high gas hydrate concentrations was the cold vent Site U1328, where beds containing massive forms of gas hydrate occurred within the uppermost ~40 m with concentrations exceeding 80% of the pore space as a result of focused fluid/gas migration from underneath. But the picture is less appealing. Figure 2 - Cores drilled at the Site U1326 in Cascadia. Click for large version. Figure 3 - Cores drilled at the Site U1328 in Cascadia. The Gulf of Mexico gas hydrates Joint Industry Project (JIP) leaded by Chevron gathered several oil companies: ConocoPhillips, Total, Schlumberger, Halliburton, Reliance (India), JOGMEC (Japan) together with the USDOE/MMS to investigate possible problem with hydrates drilling. They concluded that hydrates pose a minimal drilling hazard. Report to Congress An Assessment of the Methane Hydrate Research Program and An Assessment of the 5-Year Research Plan of the Department of Energy prepared by the Federal Methane Hydrate Advisory Committee in June of 2007. This last description matches what happens in most oceanic hydrates cores; this discovery is of limited extent due to hydrates being in the middle of impermeable clay. How to get in the energy needed to make a hydrate fluid and how to get out this moveable converted hydrate? On the 18th of February the Oil & Gas Journal published an article by Sam Fletcher entitled US-India study discovers large gas hydrate presence. It confirms the statement of an unprecedented number of hydrate cores but portraits this only picture of a core where the hydrates ar millimetric! 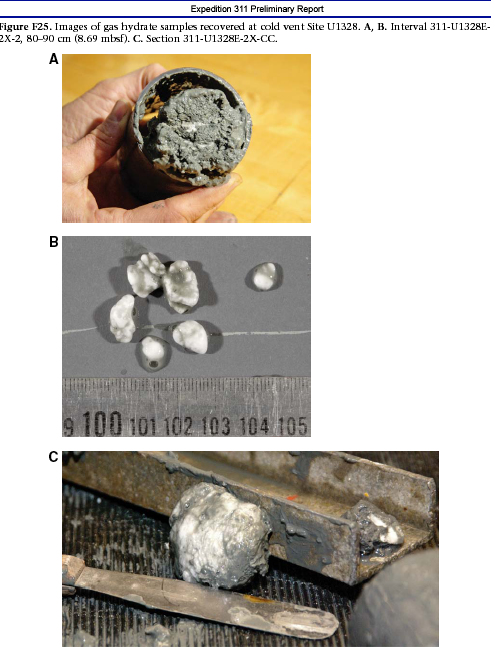 Figure 4 - Core drilled during the 2006 US-India expedition that supposedly uncovered the largest hydrate reserves known today. Fourtunatelly the NETL Methane Hydrate Newsletter (excellent Fire in the ice) from the Fall of 2006 publishes a better picture in the article International team completes landmark Gas Hydrate expedition in the offshore of India. Instead of being millimetric, the hydrate concentration is centimetric to decimetric, but far from representing huge reserves. More likely, as for Leg 164, the extension must be metric (as seen also on the seafloor). 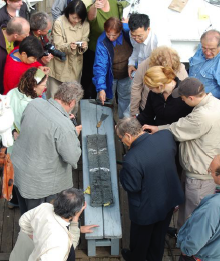 Figure 5 - Another core drilled during the 2006 US-India expedition, this time published by the NETL Methane Hydrate Newsletter. 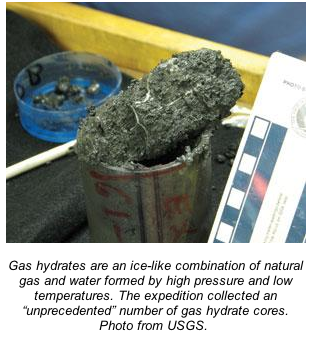 In the same newsletter the article The gas hydrates resource pyramid includes this picture of the seafloor showing that a massive hydrate is vertically decimetric and horizontally metric. 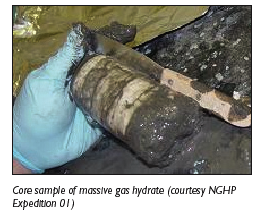 Figure 6 - Picture of large hydrate in the seafloor published by the NETL Methane Hydrate Newsletter. It is intriguing to know that the denstiy of methane hydrates in these depths is lower than water, hence pieces of hydrates should go up in the water column, except if glued to the seafloor. If huge amounts of hydrates are present they should push up the sediments: nothing like that is shown. The scattered occurrences of hydrates on the seafloor is well seen on what is collected in the trawl of fishing vessels, as shown by Cherkashev & Soloviev. But why do they stay on the bottom if their density is lower than water? The NETL HMNews Spring-Summer of 2007 confirms that hydrates are just thin filling in fractured clays, clearly seen in this X-ray of a core. Figure 8 - X-ray image of a core drilled offshore in India. China and India have reported massive finds of frozen methane gas off their coasts, which they hope will satisfy their energy needs. Indian researchers discovered a 132-meter (433-foot) thick layer of methane hydrate in the Krishna-Godavari Basin. "One of the thickest that's ever been found in the world," says Malcolm Lall, the director of the Indian gas hydrate program. The team has also been successful in the Andaman Islands, were they discovered, 600 meters (984 feet) beneath the ocean floor, a layer of frozen methane embedded in ash sediments from prehistoric volcanic eruptions. "This too is a first," says Lall. I doubt that India succeeds in producing these hydrates and I am absolutely sure that they will not satisfy their needs. NETL reported in in 2007 that hydrates had been found in China (Shenhu area of South China sea) with an unusual CH4 concentration of 20-40% (how reliable?) of pore volume in clay sediments. But no pictures of cores where provided. In 2007 South Korea found some hydrates under 6500 ft of water (not far from Donghae gasfield). But no indication on the cores and no picture that I can find. The Messoyakha and Mallik gasfields have some layers of hydrates above other layers of conventional gas. Glaciations started few millions years ago and former conventional gasfields now in permafrost. In these fields some layers of gas inside sandy reservoirs converted into hydrates layers. This means that the trapping is completely different from oceanic hydrates within clay. 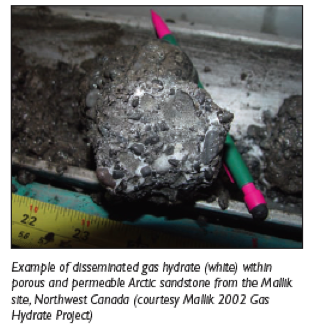 Figure 9 - A permaforst hydrate core drilled in Mallik. The production test in Mallik is confidential, financed by oil companies, but it is rumored to be producing about 1500 cubic meters per day: were it a conventional gasfield, in such remote place, it would be considered to be dry! Despite the assumed production of gas hydrate in Messoyakha and the pilot test of Mallik, where a small amount of gas was produced by injecting stream, the volumes produced are so low that could have been negligible or considered dry in any appraisal of conventional gas discovery in such remote places. Currently, there is no commercially proven way to recover methane gas from hydrates in permafrost, the most easily accessible location where hydrate is found. The Hot Ice n°1 hydrate well drilled by Anadarko in 2003-2004 did not recover any hydrate. BP drilled in 2007 a well in the Alaska North Slope to evaluate hydrate at 4 miles south of the Milne B-pad, in the Milne Point oil field, Northwest of BP's Prudhoe Bay oil field. In the 2007 report to the US Congress they confirmed gas production through depressurization. But the US Congress report said also that it is not commercial. Furthermore, the 30 Tcf of the Prudhoe Bay field is still stranded 40 years after its discovery. 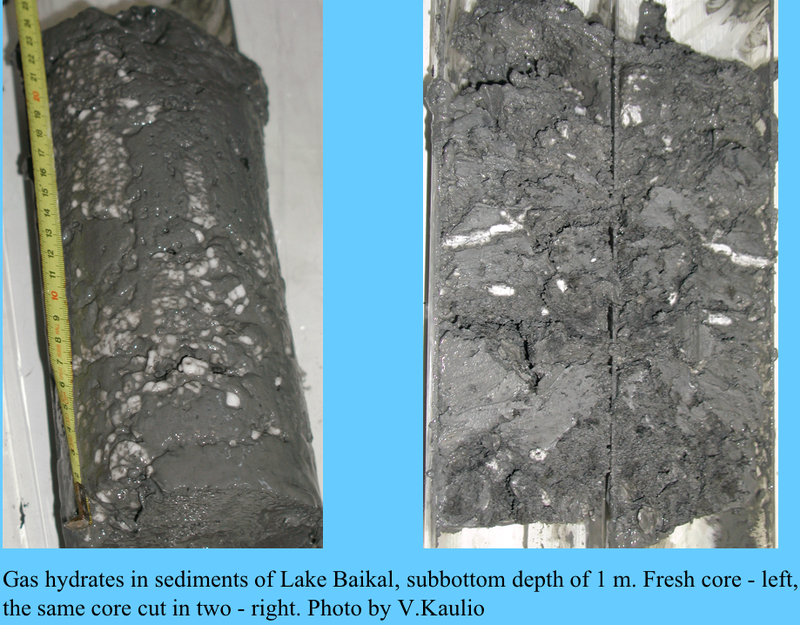 Figure 10 - A core drilled in September of 2007 in Lake Baikal showing two clear centrimetic hydrate layers. More cores deeper and at same depth few meters away should be quite interesting. The excellent book Submarine gas hydrates by Ginsburg & Soloviev published in 1994 (with a translation sponsored by Statoil published in 1998) contains many many core pictures and quotes lake Baikal with hydrates occurrences because after BSR : Hutchinson et al 1991. Cherkashev & Soloviev WPC 2002 did show some pictures of dospersed hydrate occurrences. 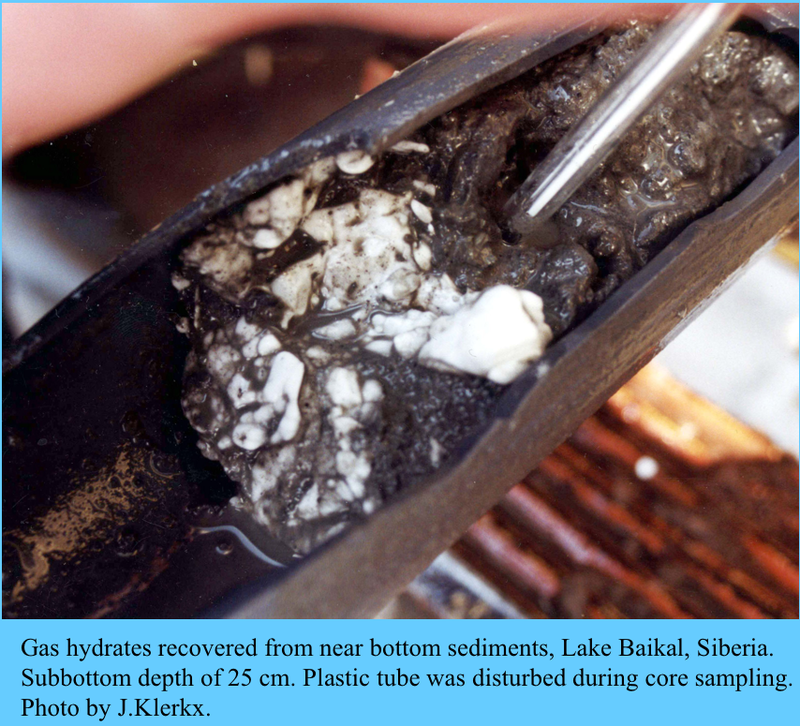 Figure 11 - Dispersed hydrates in cores drilled in Lake Baikal, as pictured in Cherkashev & Soloviev WPC 2002. Click for large versions. Hydrates are well known by gas engineers because they deposit in gas pipes as tubing or pipelines, as it is sometimes found in the permafrost by the Russians. Methanol is used to prevent the deposit of hydrates. When I met Gabriel Ginsburg, the best hydrate specialist in AAPG 1993, I asked him about the production of Messoyakha from hydrate using methanol to dissolve it. He answered that production from hydrate layers is not certain, because there is also production from free gas layers and the use of methanol was essentially for preventing the formation of hydrate. 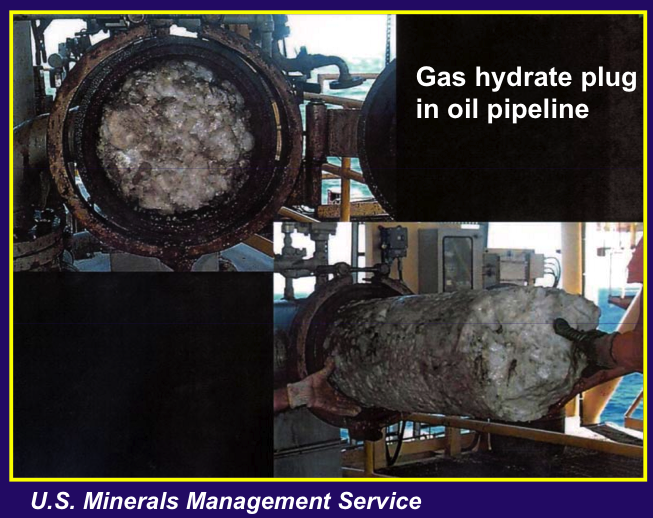 Figure 12 - Hydrate plug from a scrapper in a gas pipeline from Carolyn Ruppel . Click for large version. Alexei Milkov in Gas Hydrate Resource Potential in the Gulf of Mexico (Rice University, November 12, 2003) estimates global hydrate reserves between 500 and 2500 Gt, to compare with 10 000 Gt by Kvenvolden in 1988 (which is unrealistic looking at the geological time involved for hydrates, compared to the fossil fuels). 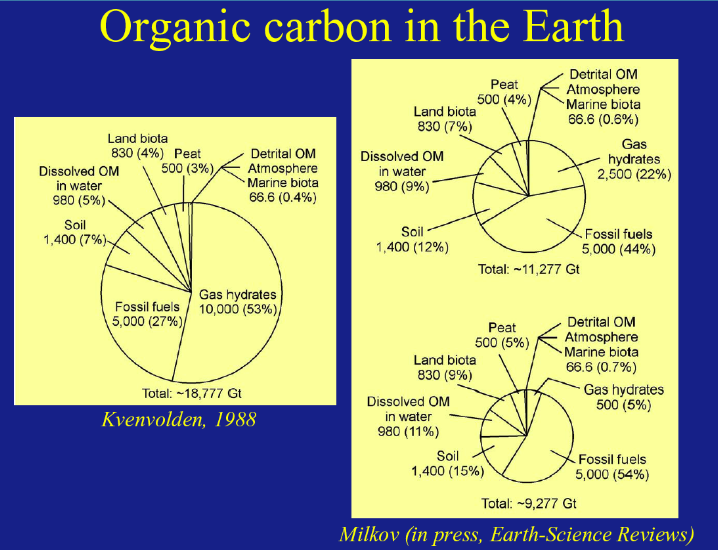 Figure 13 - Organic carbon in the Earth by Kvenvolden (1998) compared to Milkov (2003). Click for large version. With 500 Gt, hydrates are lower than dissolved methane in geo-pressured water (50 000 Tcf in the Gulf Coast) which 30 years ago were described as the energy source of future, just as hydrates are now. But production pilots in US and Japan were abandoned mainly for environmental problems: what to do with brines? No one is talking any more of producing these huge dissolved methane resources! Milkov shows that hydrates estimates have been in decline since 1973 divided by a ratio of more than 1000, being now about the volume of conventional gas, but without any technique to produce them. 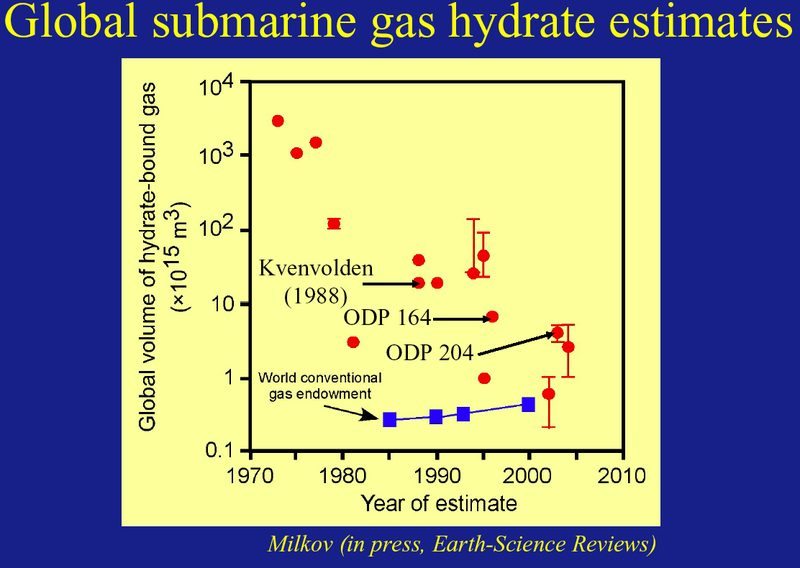 Figure 14 - Submarine Gas hydrates estimates through time, after Milkov (2003). Click for large version. Alexei Milkov, a bright young Russian geologist, has worked on hydrates in Russia and in the US, Texas A&M University, with Sassen and with BP. I met him in Houston in 2003. He knows more than anyone on hydrates resources, but now being a scholar in the Woods Hole Oceanographic Institution, I was disappointed to find () that a recent study refers to this obsolete 10 000 Gt in order to justify the importance of studying hydrates. The UNEP yearbook 2008 is referring to this 10 000 Gt obsolete estimate saying that sediments in oceans continue to accumulate for centuries and millenia (but even this would not be enough to get 10 000 Gt!). Figure 15 - Carbon sources as reported by UNEP. Since 2002 many hydrates discoveries have been made in countries eager to get domestic methane production as in Japan, India, China and South Korea. But as in previous discoveries in US Cascadia and Blake Ridge, hydrates are of limited extent, quite dispersed and mainly in clay sediments in deepwater. Permafrost drilling finds different hydrate types, being frozen from former conventional gasfields. Estimates of methane hydrates have been divided by a factor of 1000 but old estimates are still quoted in order to get financing. An offical report to the US Congress states that there is no commercial hydrate production technique available. Oceanic hydrate methane will stay unproduced as marsh gas or methane in cows or termites. My only unanswered question is: why hydrates being lighter than water are not popping up to the sea surface? Japan is celebrating a groundbreaking science experiment in the Arctic permafrost that may eventually reshape the country's fragile economy and Tokyo's relationships with the outside world. In fact, the seabeds around the Japanese coast turn out to conceal massive deposits of the elusive sorbet-like compound in their depths, and a country that has long assumed it had virtually no fossil fuels could now be sitting on energy reserves containing 100 years' fuel. Critically for Japan, which imports 99.7 per cent of the oil, gas and coal needed to run its vast economy, the lumps of energy-filled ice offer the tantalising promise of a little energy independence. In 2007 the Ministry of Economy, Trade and Industry declared that there were more than 1.1 trillion cubic metres (39 trillion cubic feet) of methane hydrates off the eastern coast - equivalent to 14 years of natural gas use by Japan at current rates. Academic studies suggest total Japanese deposits of 7.4 trillion cubic metres. Messoyakha Gas Field : While the west postulates methane-hydrates recovery, the Russians have been producing from it for years. The Messoyakha gas field in the frozen northern Russia is an excellent example of a hydrocarbon accumulation from which gas has been produced commercially from hydrates, mostly by simple reservoir depressurization. At least one-third and, most likely, two-thirds of the Messoyakh reservoir, which for 13 years has been in commercial production, occurs in the form of natural gas hydrates. It is conservatively estimated that about 36% (about 5 billion cubic meters) of the gas withdrawn from the Russian field has come from the gas hydrates. The Blake Ridge hydrate resource is super-giant sized but the 250 meter thick free-gas underneath is the real commercial prize. The Hydrate zone above serves as a nice cap to trap the free gas underneath. The entire Blake Ridge-Carolina resource has been estimated to contain between 1,000 to 1,300 trillion cubic feet of methane, mostly 99% pure. An estimated 25-40% of this is a free gas resource much of which is commercially viable today, (Estimated, 100-250 trillion cubic feet recoverable). Significant clean free gas reserves and associated lower concentration Hydrates are known to be locked beneath the seafloor under vast areas within the Blake Ridge-Carolina Rise region. These super-giant Probable free-gas reserves cover an area, which is 75% within the US OCS 200 mile EEZ. 1. The Strategic Nine Corp., Consortium has made an International Resources Rights Claim, for the approximately 25% area of the Blake Ridge Gas resource located outside of the US 200 mile EEZ. 2. The Consortium has also made application for a very large unsolicited OCS Petroleum Extraction Lease on a non-competitive basis, within an area of the Blake Ridge-Carolina Rise, located beyond state jurisdiction but inside the US EEZ, within an area currently covered by a nation-wide Federal moratorium on new offshore leasing until June 2012. A waiver has been requested. 1. Confirmed presence of super-giant areal extent of high FREE GAS saturation (proved by coring and well logging, and by geophysical methods) in shallow, easily accessible reservoirs. 2. Occurrence within fine sediments much of sufficient reservoir quality to support horizontal well-based fracc production methods. 3. Site accessibility through close proximity to existing major US East coast markets and other infrastructure. 4. Additional 1,000 Tcf speculative resources of Gas Hydrates, some of which may become economically viable in the future. Thanks for the information about Blake Ridge off the coast of South Carolina. There was some speculation that areas off the coast of Virginia might contain natural gas. Some wells off the coast of New Jersey were drilled about three decades ago and discovered non-commercial hydrocarbons. The geology of the region off the coast of Virginia near the mouth of the Chesapeake Bay was similar to the geology of the Deep Panuke gas field off the coast the eastern maritime of Canada. Deep Panuke had the potential to be a 12 mile long field during the intitial discovery phase, but disappointed in as much as only 1 mile of the structure was filled with natural gas. Predicted about one trillion cubic feet of natural gas URR after delineation drilling. 6 to 10 million years is plenty of time ... look at what the Republicans have accomplished with the 6000 years of resources created since gENESIS occurred. Seriously, people believe this young universe crap and 10 million years seems as foreign and outlandish to them as 500 million years. Very good article for us social science types, who don't have these kind of facts at hand. I have had hydrates pitched heavily as a global solution to the energy crisis by evangelical Christians and preachers, mainly Bible literalists. Add abiogenic theory and you have eternal energy supplies, of course! No worries. Just turn Right at the very margin of science and belief. No elections, either! Faith in hydrates is one of those "fact patches" the True Believer lobby applies to justify inaction by governments on conservation, renewables etc... especially those they can influence. The other one is, of course, Revelation and the rapture, which eliminates the need for forward thinking. Thank you for the BS (Bible Study?) antidote. Thankfully, the Christian Green or Stewardship Movement seems to be growing pretty fast these days. This also has roots in BS (excuse me if that's sacriligeous to some folks), perhaps deeper than "do-nothing about US oil imports" Christians. Permafrost shows temperature rather than pressure at depth is crucial to holding these compounds. Maybe as some shallow seas warm they will release methane. Near home is a keragen bearing Permian shale evidently deposited in glacial meltwater. However hundreds of metres of overlying sediments are completely barren of fossils. Maybe evidence of H. sapiens will show in marine mud then suddenly disappear after the next big methane burp. Yesterday, Der Spiegel had an arcticle about hydrates. The frozen floor of the arctic ocean is melting and releasing methane. The article is in German so far, they might translate it later. Thanks - The Automatic Earth references the same article today - translated into English. The link you provided is in German - for me. In other words, they aren't hydrates any more but free gas by the time they reach the surface. Might it be the case that methane hydrates are actually heavier (denser) than water at depth (under pressure)? This could be the case if they are highly compressible. 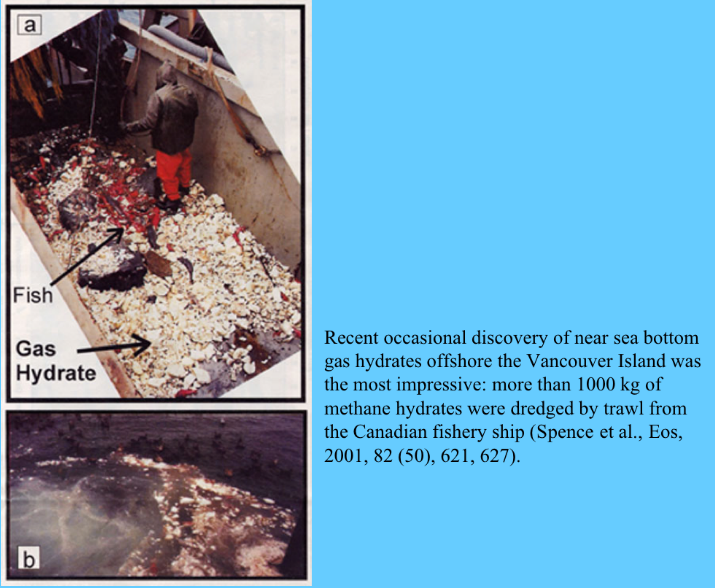 How many cubic feet of gas is there in a ton(tonne) of methane hydrates? Good point. A cubic foot of ice weighs 62.4 pounds, so there are 32 cubic feet in a ton. There are 164 cubic feet of gas in a cubic foot of methane hydrate ice, or 5256 cubic feet of gas per ton, ~1 barrel of oil equivalent per ton of methane hydrate. A ton of oil sands produce 1/2 boe. Except that the oil sands are not buried under the ocean or under a thousand meters of permafrost. What about this for a hydrate recovery idea: Instead of trying to recover hydrates from the oceans, why not use Siberia's peat bogs. Install one acre sized tents, add hot air to get the ground to release its methane, then capture, compress and transport it to market. Your fixation with core photos is very curious. As I would expect that you know, Gas hydrates are unstable at surface temperatures and pressures. Very cold ambient conditions in the arctic moderate this, and allow gas hydrate to remain in coring equipment during the trip to the surface (and the photo op). However, the slow trip to the surface through 1000 m or more of warm ocean water will dissociate hydrate that is recovered in conventional coring equipment. Only pressure cores can change this situation, however, they do not allow photos to be taken. Therefore, scientists rely on the proxy indicators for many assessments. This is not unlike traditional oil-field practices where oil and gas fill is determined based on resistivity, etc., often without core photos! I am aware of well-log data from Nankai and the Gulf of Mexico that shows high resisitivity and high sonic velocity with insitu T of 40 or 50 F, please do. What is that, if not gas hydrate? You should also look up Klauda and Sander ref for some insight on the continued use of the Kvenvolden number and the resistance to jump to Alexi's number. Also, the Japanese have conducted several expeditions and report that their hydrates are not dispersed in clay but at high concentrations in sands, and are not of limited extent (40 tcf in place confirmed thus far). They, themselves are funding this work, and therefore are not likely to be engaging in hype to secure funding from some third party. Korea, China, US, and India marine hydrate exploration programs are very new (only 1 expedition each and very large areas to explore) and as such cannot reasonably be stated to have fully assessed how hydrate occurs in those waters (dispersed in clay or concentrated in sands or what). You wouldn't want to have assessed oil and gas potential in the Gulf of Mexico after just a handful of wells would you? Bottom line: We do not know enough yet to make conclusive claims about either the volume of the in-place resource, the technically-recoverable resource, or the commercially-viable resource (at some future time and under market conditions we cannot even hope to guess at now.) Milkov does have that information, Kvenvolden doesn't have that information, nor does NETL or you. If we want to know, we will have to do the work. A hydrate is created when a molecule of gas - in this case, methane or natural gas - is trapped by high pressures and low temperatures inside a cage of water molecules. The result is almost - but not quite - ice. It's more like a dry, white slush suffusing the sand and gravel 1,000 metres beneath the Mallik rig. So far, no Canadian agency is planning a full gas hydrate pilot project. But Japan is planning one using data from the Mallik project. The United States Geological Survey is trying to start one with other agencies and energy companies. Commercial production of natural gas from hydrates is still a few years off, said Dallimore - but perhaps not too far off.